A couple of weeks ago my son Josh returned from a friend's house and handed me a sheet of paper. He announced, "I found your next blog post!" He said his friend's mom made the best cookies, and he asked her for the recipe so I could make them and post them on my blog. As I glanced over the recipe I noticed coconut was listed as an ingredient. I am not a fan of coconut and neither is Josh so I was surprised that he liked this recipe so much. He said the cookies were really good even with coconut in them. Yesterday was a half day of school so he helped me make these cookies. I have to agree with him that they are really good, even with the coconut. 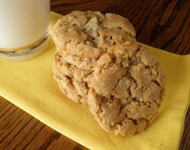 The cookie is soft and chewy, and the coconut does add a bit flavor but not too much. Thanks to Stacey for sharing this wonderful recipe with us. Cookies with oats, cereal, and coconut. 1. Cream together the butter, sugars, eggs, and vanilla.2. In a separate bowl combine flour, baking soda, baking powder, and salt.3. Add dry ingredients to wet ingredients and mix until well combined.4. Stir in oats, Rice Krispies, and coconut.5. Shape dough into walnut-sized balls and place on ungreased cookie sheet about 1 inch apart.6. Bake at 350°F for 8 to 10 minutes or until lightly browned.7. Cool for about 1 minute on pan and then move to a wire rack to cool completely. I´m gonna take this recipe...Those are so tasty!!!! Josh must have been very excited to have these made for him they look awesome! How fun! I have heard of ranger cookies before but hadn't seen a recipe. I love all the unique ingredients. Hmmm, they sound great, and I happen to love coconut. These sound so good. Great to make with kids. I like the rice krispies in there. That's so cute that he got the recipe for you! I never heard of ranger cookies before. They sound delicious! Ranger cookies are awsome! 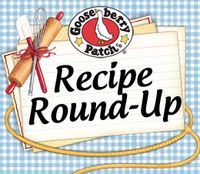 There are so many different recipes for them, but yours sounds delicious! I love the addition of the rice crispies, they must provide a delicious crunch! Great ingredients. Must be a delicious cookie. I love chewy cookies. You owe your son, big time, for this cookie. Fantastic recipe, I had something similar! Love how you made them, sound so delicious!! !I will try it soon! I love oatmeal cookies. Those look lovely. I think my nephews will love these when they come to visit. Thanks for sharing and a special thanks to Josh for being so on top of things! I am going into overload today with all the recipes I want to try. I LOVE coconut so these are really speaking to me right now. My son recommended this blog and she was totally right keep up the fantastic work! Why are they called Ranger cookies anyway? That's a good question Jeff--I'm not sure why they are called ranger cookies. I think it is because the Texas Rangers, Forest Rangers, and Army Rangers all like to eat them in their Ford Rangers. Yum-yum. This will be my next cookies to prepare! Very nice and unusual idea, thank you for this delicious post) I like cooking very much and I always gather new interesting recipes. Keep on sharing, you are the professional.